The origins of a line of martial arts are based on the movement, strength and credibility of the individual master, his instructors and his students. The strength of the movement determines how strong the style is and the credibility of that generation of individuals. The achievements of Grandmaster “Iron” Kim demonstrate the strength and credibility of the Oom Yung / Chung Moo line of martial arts knowledge. As an apple is thrown toward Grandmaster “Iron” Kim, he cuts it into 4 pieces with a sword. Tremendous speed, accuracy and timing is necessary in order to accomplish this feat. 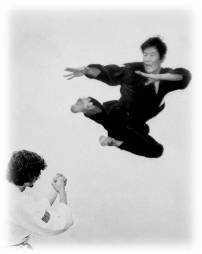 At the age of seven, Grandmaster “Iron” Kim began his life’s path in the study and practice of martial arts. To achieve perfection of his martial art movements, Grandmaster “Iron” Kim many times chose the solitude of the mountain and ocean areas of Asia to practice the forms and techniques that he learned. Although he learned from many qualified teachers, a majority of the knowledge that Grandmaster “Iron” Kim possesses was passed down through Grandmaster Wang Po, the 7th generation Grandmaster of Yin Yang Doe.